The Red Cross has issued an urgent appeal Monday for blood now that there is less than a half day supply on the shelves in Northern Utah. 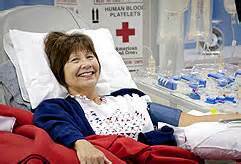 The American Red Cross of Utah is asking residents to give a potentially life-saving blood donation. Photo courtesy American Red Cross. A blood drive has been organized for today at the Aggie Recreation Center on the Utah State University campus from 11 a.m. to 5 p.m.
Another one Thursday, Jan. 28, is set at the Brigham City Community Center from 12 noon to 5 p.m. The new Red Cross Bloodmobile will be at Lee’s Marketplace in Logan, Friday, Feb. 8 from 11:30 a.m. to 5 p.m.
Other upcoming blood drives are scheduled Thursday, Feb. 14 at Logan’s Youngblood Realty; Tuesday, Feb. 19 at the Logan Chick-fil-A; Thursday Feb. 21 at Lowes in Logan and Feb. 28 at the Logan Smith’s, 759 North Main. Red Cross official Tim Schwen said the need for blood is constant and your contribution is important for a healthy and reliable blood supply.